Super Savings Item! Save 31% on the Criacr Smart Plug, WiFi Wireless Control Mini Sockets with Energy Monitoring, Timing Function, Work with Amazon Alexa and Google Home, Remote Control by Smartphone from Anywhere (2 PACK, White) by AMIR at Wise Warthog. 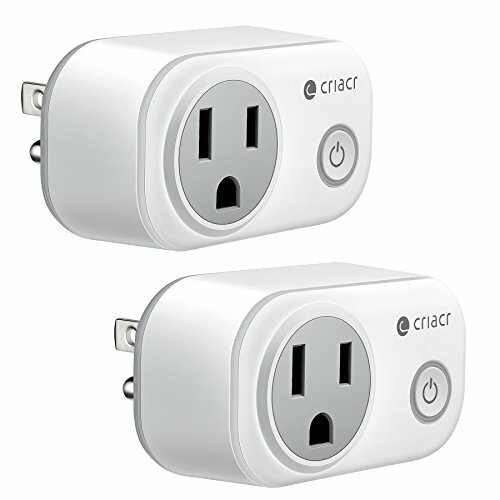 MPN: Criacr HA100US Mini Smart Plug. Hurry! Limited time offer. Offer valid only while supplies last. Mini smart plugs are useful equipment to make you have a smart life. They can make your household appliances more intelligent and convenient. ❤Voice control & remote control by smartphone, compatible with Amazon Alexa and Google Home. ❤With ETL & FCC approved, sleek, mini & compact design, safe to use & save space. ❤Timing function, customize your schedule, household appliances turn on/off according to your scheduled. ❤Energy monitoring, display the power consumption, support status tracking, save energy and extend product life. ▲Please read the user manual before using. ▲Please keep products in a good and safe use condition. ▲Put the socket in proper condition and out of reach of the children. ▲Do not disassemble the plugs, otherwise there may cause security risks. 【CONVENIENT TO CONTROL】Compatible with Amazon Alexa and Google Home via voice control, just download the free APP on your smartphone and control your appliances wirelessly by smartphone. One button beside the socket is for switching on/off, which makes you convenient to control your appliances. 【MINI & DELICATE DESIGN】With mini, compact and lightweight design, it looks simple, exquisite and elegant. You can plug on any wall socket and it makes your home more intelligent and tasteful. Crafted with small size, it takes up less space and it is beneficial to plug in wherever you want. Without blocking, enable you to use the other outlet. 【ENERGY MONITORING & SECURITY ASSURANCE】Built-in energy monitoring, you can track real-time and historical power usage of the appliances on the "Smart Life" APP of your smartphone. With high-quality and ETL & FCC certifications, for safety and quality assurance, it can prevent overcharging and overheating, keep you and your electronics safe and extend your appliances life. 【TIMING FUNCTION & SETTING SCHEDULES】With timing function, you can schedule the smart plug to turn on/off electronics automatically. Controlling lights, electric heater, air conditioner or other devices to turn on before you arrive and turn off after you leave. Reduce waste, save time and lower electricity bills. 【EASY TO USE & INSTALL】 Just plug the smart plug into the wall socket and plug a device into it. Follow the user manual, download the free app by scanning the QR code, create an account and connect the devices to your smartphone, and then remotely control by your smartphone, no hub required. Very simple to use and install.